There is nothing easier than grabbing five simple ingredients at the store and throwing them into your slow cooker for an easy weeknight dinner! 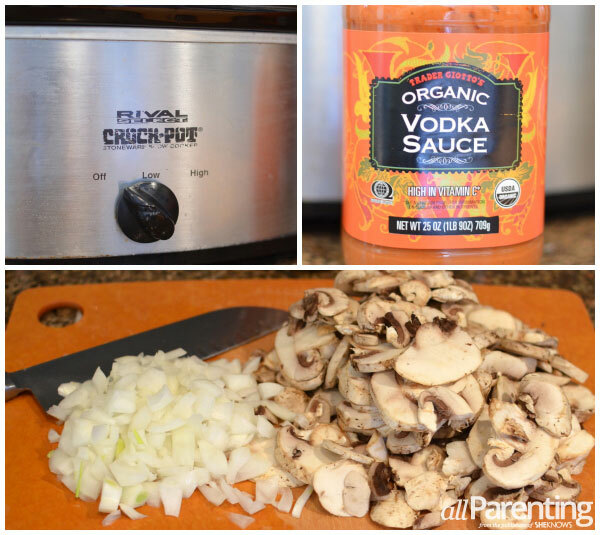 Chicken, veggies and creamy vodka sauce make for a scrumptious dish to pour over pasta or rice. A delicious dinner with just five ingredients? Yes. It’s possible and so simple. One of my favorite grocery stores to grab ingredients for quick and easy meals is Trader Joe’s. If you don’t have a Trader Joe’s by you, these five ingredients can be found at any grocery store. I just happen to hold a special place in my heart for Trader Joe’s Vodka Sauce. So grab your Crock-Pot and throw in these five ingredients and let the pot do all of the work for a delectable and comforting weeknight dinner! Please note that I do not count olive oil, salt and pepper as an “ingredient” for this five-ingredient dinner since most people have those three items at home already. In a medium saucepan, heat olive oil. Add onions and sauté for 8 to 10 minutes or until soft and translucent. Add sliced mushrooms to onions and sauté until browned, about 5 to 6 minutes. Meanwhile, rinse and pat dry chicken breasts. Place in bottom of slow cooker. 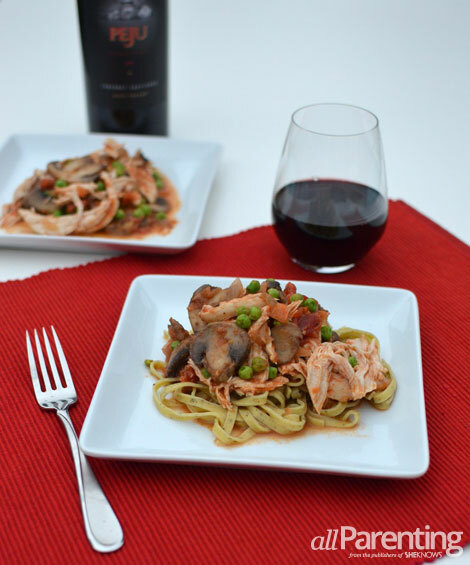 Pour vodka sauce over the chicken in the slow cooker. Top with sautéed onions and mushrooms. Cook on low for 2 to 4 hours, depending on the size of the chicken breasts. Remove chicken breasts from slow cooker and using 2 forks, shred chicken. Return to slow cooker and stir to combine all ingredients. Add frozen peas and allow to heat through about 15 to 20 minutes. Enjoy chicken and veggies all by itself or serve over egg noodles, pasta or rice.